The holidays are here. Amid the hustle and bustle of the season, we are often asked to bring a dish, snack or appetizer to a holiday gathering. These recipes are simple to make and tasty to eat. Try one of these the next time you’re asked to bring something to a gathering. 1. 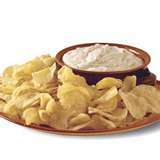 Mix sour cream, salsa and ranch dip mix in a medium bowl. 2. Chill or serve immediately with nacho chips. 1. Add chickpeas to food processor and puree. 2. Add roasted red peppers and remaining ingredients. Puree until smooth.